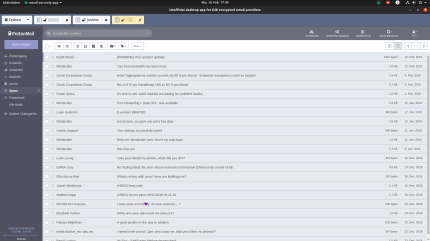 ElectronMail is an Electron-based unofficial desktop client for ProtonMail (https://protonmail.com/) and Tutanota (https://tutanota.com/) end-to-end encrypted email providers. The app aims to provide enhanced desktop user experience enabling features that are not supported by the official in-browser web clients. It is written in TypeScript and uses Angular. Multi accounts support per each email provider including supporting individual entry point domains (https://github.com/vladimiry/ElectronMail/issues/29). 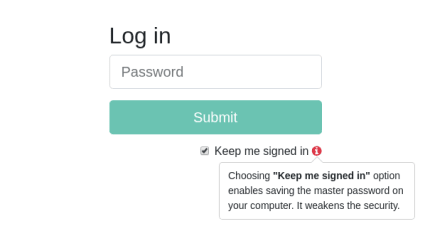 Automatic login into the app with a remembered master password using https://github.com/atom/node-keytar module (keep me signed in feature). Automatic login into the email accounts, including filling 2FA tokens (https://github.com/vladimiry/ElectronMail/issues/10). Native notifications for individual accounts clicking on which focuses the app window and selects a respective account in the accounts list. System tray icon with a total number of unread messages shown on top of it. Enabling local messages store improves this feature (how to enable - https://github.com/vladimiry/ElectronMail/releases/tag/v2.0.0-beta.1), see respective issue https://github.com/vladimiry/ElectronMail/issues/30. Switchable view layouts (full, tabs and dropdown). See details here https://github.com/vladimiry/ElectronMail/issues/36 and screenshots here https://github.com/vladimiry/ElectronMail/tree/master/images. Batch emails export to EML files. Feature released with v2.0.0-beta.4 version (https://github.com/vladimiry/ElectronMail/releases/tag/v2.0.0-beta.4), requires local messages store feature to be enabled (see how to enable here https://github.com/vladimiry/ElectronMail/releases/tag/v2.0.0-beta.1). Full-text search. Enabled with v2.2.0 release https://github.com/vladimiry/ElectronMail/releases/tag/v2.2.0. See the respective issue for details https://github.com/vladimiry/ElectronMail/issues/92. Built-in/prepackaged web clients. The built-in web clients are built from source code, see respective official Protonmail (https://github.com/ProtonMail/WebClient) and Tutanota (https://github.com/tutao/tutanota) repositories. See https://github.com/vladimiry/ElectronMail/issues/79 and https://github.com/vladimiry/ElectronMail/issues/80 issues for details. Configuring proxy per account support. Enabled since v3.0.0 release https://github.com/vladimiry/ElectronMail/releases/tag/v3.0.0. See https://github.com/vladimiry/ElectronMail/issues/113 and https://github.com/vladimiry/ElectronMail/issues/120 issues for details. This is required to connect the snap with the system's default keyring to save and access encrypted passwords securely.